It is easy to believe that battlefield tourism is a modern phenomena but in terms of the Great War it began as early as 1919 with the publication of the first battlefield guide. Today the huge number of travellers who went to France and Flanders in the 1920s and 30s is forgotten; at one peak it was estimated than more than 300,000 people travelled to the battlefields in one year, for example. This image comes from a small album owned by a veteran of the 11th Battalion Suffolk Regiment (Cambridgeshire). The Cambs battalion took heavy casualties at La Boisselle on 1st July 1916 – the First Day of the Battle of the Somme – and fought in many other engagements on the Somme, Arras, Ypres and Hindenburg Line. This veteran returned to the battlefields twice in the 30s and in 1936 went on a special pilgrimage with his old comrades of the 11th Suffolks to attend ceremonies on the Somme for 1st July 1936 – the 20th Anniversary. Our image of Great War veterans is now of old men, but here they are middle-aged in their 40s. There are some decorated men among them; one has a Military Cross and another a Military Medal. The older man in the middle of the group has campaign medals going back to the Boer War. 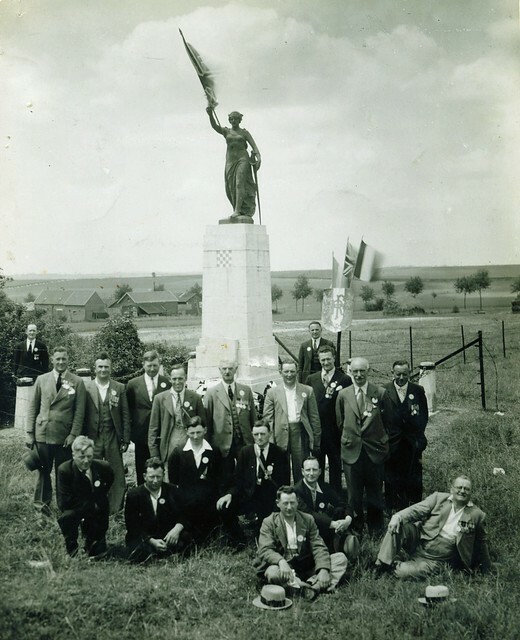 The white disk they are all wearing has a chequer-board in the middle; the insignia of the 34th Division whose memorial they are standing in front of and with whom the 11th Suffolks served. It is a poignant reminder that when we visit the Somme, we travel in the footsteps of earlier pilgrims. This entry was posted on 26/01/2012 by sommecourt. It was filed under France, Great War, Somme, War Memorial, Western Front, WW1 and was tagged with 1936, Battlefields, La Boisselle, Somme, Veterans, WW1. Already said Paul, but this is may favourite of all you have posted so far. What these fellows must have been thinking, both privately and publicly as they went on these pilgrimages we can never really begin to fully comprehend. And your comment about the likes of us, who now regularly visit these battlefields, whether on our own or with groups is spot on the nail. Never forget and always remember. This is a great shot. It clearly shows that in 20 years the ground had returned pretty much ‘to normal’; fences up, houses built, farming being carried out. This spot – the 34th Division Memorial, popularly known as ‘La Madeleine’ – has not changed a lot since then. But I have often wondered why the memorial is sited here. Although a fairly high point within the village of La Boisselle it is off the beaten track, set away from the main road and hence not easily visible, and is situated quite far back into the German lines as they would have been in 1916. The nearby Lochnagar Crater, or Gordon Dump CWGC Cemetery, would seem, on the face of it, more sensible/appropriate places for the Divisional Memorial to be placed. Either way, it’s a lovely spot – one I’ve been visiting since I was six. I’m not sure but the statue does not appear to hold a laurel wreath in her right hand in this photo. I seem to recall there was one when I first started visiting, but it disappeared some years ago – when the price of bronze went up! Many of my maternal family served in this battalion in the War and two grand-cousins were killed within a few weeks of each other, having enlisted together (they had consecutive numbers). This photo is fascinating and I have to wonder whether any of my relatives are staring back at me. A fine reminder of those who survived. Wonderful pic. Interesting as these men went over alongside the 16th Royal Scots. The battalion arose when the Heart of Midlothian players enlisted. ‘McCrae’s battalion’ tells their story of the fighting there. Great to see this picture!